Researchers at Nagoya University in Japan are developing technology that would incorporate particles from space to look into the crippled Fukushima Daiichi nuclear reactor vessels. The team comprises researchers at the state-run university’s Kobayashi-Maskawa Institute for the Origin of Particles and the Universe, and is led by Associate Prof. Mitsuhiro Nakamura of the university. Their aim is to establish technology that can obtain images similar to X-rays of what is happening inside the Nos. 1 to 3 reactor buildings. They hope to have the technology developed for the project soon, but radiation levels near the crippled buildings are also a severe impact on the mission. Therefore the research team is prepared until the amount of radiation being emitted from the reactors falls to limits that allow workers to complete the necessary tasks without risk of exceeding their dose limit. The Yomiuri Shimbun has learned that a team of researchers from the university is developing technology to use elementary particles from space to see into the interiors of crippled reactors at the Fukushima No. 1 nuclear power plant. 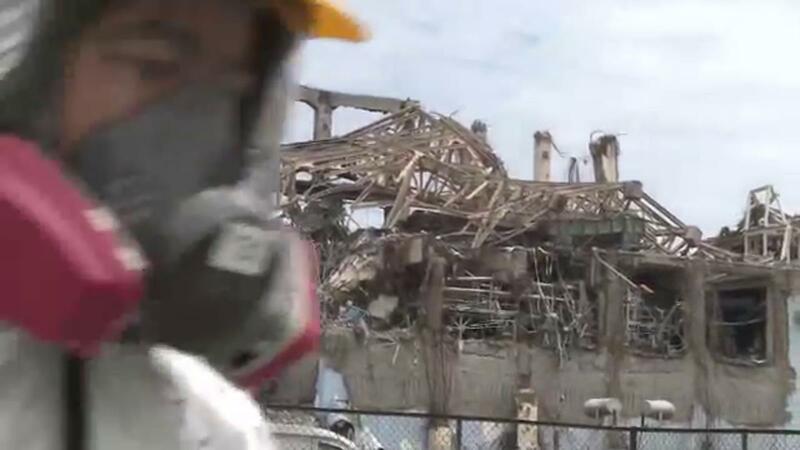 Future steps of the decommissioning plan require TEPCO to properly decontaminate the site, retrieve the molten materials, however to do so the power utility must know exactly where the lumps of nuclear fuel are in the reactors. The exact locations of the melted-down nuclear material in the Nos. 1 to 3 reactors and their container vessels are currently unknown. The government has therefore thrown its support behind the critical project at Nagoya University. The researchers are using elementary muon particles in lieu of X-rays. Muon particles are one of 12 kinds of elementary particles that constitute matter. They have properties similar to electrons, but weigh about 200 times more, and fall to Earth from space at a rate of one particle onto a person’s palm per second. The muon is an unstable subatomic particle, most naturally occurring muons are created by cosmic rays, which consist mostly of protons, many arriving from deep space at very high energy. Observation of muon particles penetrating the reactors will make it possible to determine differences in density within the reactors, the researchers said. The muon is a fundamental particle that acts like a heavy electron, with a mass about 207 times that of an electron. Muons are unstable and fall apart in 2.2 millionths of a second on average, decaying into electrons, neutrinos and anti-neutrinos. After their discovery it was observed that the number of these muons decreased as you got closer to the earth and the natural (and correct) conclusion was that they were not stable particles like the electron, and they decayed to other more familiar particles (electrons and neutrinos) in about 2 millionths of a second. Muon particles have a strong ability to penetrate substances, but are absorbed in proportion to the concentration of those substances. The greater the density of the substance they pass through, the more muon particles are absorbed and the more their number declines, according to the study team. By setting a special film measuring one square meter near each of the reactors, researchers will be able to create an image of their interiors based on the muon particles penetrating the reactors, they said. As the density of nuclear fuel is higher than steel and other materials used in the reactors, the areas containing the fuel will appear paler than the images of other materials on the special film, making it possible to determine the exact locations and shapes of melted-down nuclear fuel, the researchers said. When the fluoroscopy method is applied to reactors, however, the special film may be affected by gamma rays emitted from the reactors, the researchers said. Gamma rays also have strong powers of penetration. The research team therefore plans to shield the reactors with lead, so only muon particles can be detected.